The Outbreak project's splash page. Developed by Kevin Kee and John Bachynski at Brock University, and three undergraduates, Outbreak is a work in progress. 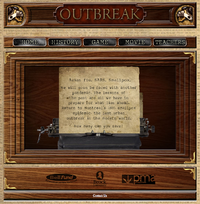 The current version takes the form of Flash-based strategy game hosted at http://www.outbreak1885.com/and is intended to supplement the 2009 “docu-fiction” film Outbreak: Anatomy of a Plague inspired by Michael Bliss’ 1991 Plague: How Smallpox Devistated Montreal. The project is currently funded by Brock University, PMA Productions (the producers of the film), and Bell Fund, a not-for-profit organization that invests in new media projects associated with television productions. In their 2009 paper ‘Outbreak: Lessons Learned from Developing a “History Game,”’ Kee and Bachynski state that “[f]un, it should be noted, was not an emotion we aimed to elicit.” Rather, the player is intended to feel overwhelmed and frustrated. The pursuit of creating an accurate reflection of history combined with this unusual take on gameplay has contributed to the game becoming more of a simulation. The initial development team was composed of Kevin Kee (Project Manager and Researcher/Writer), John Bachynski (Interactive Designer), Andrew McNiven (Graphic Designer) and Joe Peric (System Designer). They chose Flash as their platform, to ensure it would reach the largest potential audience, and utilized the FlexBuilder and Actionscript tools in the early development. The game’s visual elements were designed both in Photoshop and within Flash. In later stages of development, the development team collaborated on the game with two companies; Cerebral Vortex Inc. for the graphic design and web development and Furi Inc. for the programming. 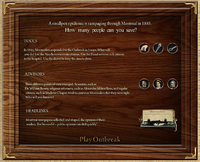 The Outbreak project emerged from Kee and Bachynski’s interest in the use of computer games as educational tools and the history of the 1885 Montreal smallpox pandemic. They have stated that they were particularly influenced by history-based titles like the Civilization series, Age of Empires and the Call of Duty series, in addition to Paul Kennedy's book The Rise and Fall of the Great Powers: Economic Change and Military Conflict from 1500 to 2000. When it came time to develop the game, they borrowed elements such as mechanics, viewpoints, in-game advisors and aesthetics from numerous on-line strategy games, including Patrician II, September 12, Defend Your Castle and the McDonalds Game. Outbreak was originally intended as a marketing tool for Outbreak: Anatomy of a Plague (then called The Year of the Plague). Kee and Bachynski envisioned a multi-media environment that would complement the film and the book. The film presents the history of the smallpox epidemic and a fictionalized projection onto present-day Montreal, inviting the audience to consider how a modern city would react to a similar crisis. The creators now aim to supplement the web page with discussion forum for the game, book and film, provide clips from the film and primary source material such as newspaper articles, and expand the game to include other diseases, rates of infection and tools. Outbreak's tools, advisors and headlines. The game concept emerged from both the film and the history detailed in Michael Bliss’ Plague: How Smallpox Devistated Montreal. The smallpox pandemic lasted from March of 1885 to May of 1886, with an estimated 9600 to 19000 people contracting the illness, of which 3234 to 5864 died, for a mortality rate of 31-34%. The outbreak was particularly devastating due to inept handling on the part of the city, strained relations between the English and French residents and conflicting information on the value of vaccines, sanitation and quarantine of the sick. Furthermore, smallpox is highly contagious, and Montreal was hit with the deadly hemorrhagic strain. An infected person near death begins to bleed under the skin, causing a characteristic charred appearance, or to bleed from pores and orifices. It’s an ugly, frightening way to die, earning it both the name “black pox” and infamy as Edgar Allan Poe’s Red Death. To simplify the complexity of the situation into playable elements, Kee and Bachynski chose to boil down player actions to quarantine, vaccine and sanitation, drawing off strategy games for the play mechanics. Though they tried to include, for example, representations of the French and English populations, such details had to be cut; it was revealed in play-testing that attempting this degree of historical accuracy muddied the game experience and contributed to player frustration with the mechanics. Advisors. These figures are based on three historic figures mentioned in Bliss’ book. Each represents one the three major philosophies on handling the crisis (namely, pro vaccination/quarantine, anti vaccination/quarantine but pro sanitation, and a middle ground “voice of the people”). The advisors actively contradict one another, simulating the confusion the general populace experienced. Newspaper headlines. These are based on actual articles from the height of the plague. The headlines provide an up-to-the-minute reaction to player actions based on and form a more reliable barometer of the state of the city than the Advisors. Cause and effect relationships. The in-game reaction of the simulation to the player’s actions is based not on the modern understanding of disease, but rather the knowledge of the late 19th century. 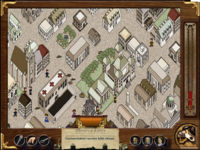 The player must thus develop an understanding of how Montreal’s residents viewed, for example, their ongoing sanitation problem in relation to the plague in order to succeed. Game sprite states. Five possible states can be directly observed, all of which must be monitored – Angry (caused by over-vaccination or too much garbage in the streets), Vaccinated, Not Vaccinated, Sick and Dead. Kee and Bachynski mention two more, Carrier and Carrier but Vaccinated. These last two states are not directly evident in the current version of the game, and may thus exist as background functions the player is not intended to observe directly. Player stress. The game does not have a victory condition. Instead, the goal is to keep the city from succumbing for as long as possible by interpreting the feedback mechanisms to maintain a temporary balance. A thermometer at the right side of the game window shows how close the player is to losing control; it flashes red and a throbbing heartbeat sound effect plays when the red bar reaches the top. The game tracks how long the player has managed to keep the simulation afloat and presents it as part of their score at the end. The aim is to develop an understanding of the mechanics by goading players into trying to beat their previous time. Outbreak is aimed at high school and undergraduate students, as a supplement to the film and the book. As such, the web page is currently split into four areas – a brief history of the Montreal pandemic, a movie page with information about the film, the game itself, and a teachers’ lesson plan for integrating either the game or the film into the classroom. Outbreak isn’t trying to be a comprehensive representation, but it is pointed. 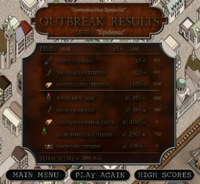 Kee and Bachynski stated, “our goal was not to illustrate how to contain a smallpox epidemic, but instead to underscore the difficulties inherent in containing it.” The game makes this clear by providing brief contextual summaries before each of the three stages, each of which introduces a new tool. The first part, in which the player must isolate sick (green) citizens, is mapped the initial infection, the second stage, introducing vaccination, maps to midsummer when the outbreak was becoming apparent, and the final stage throws waste and body removal into the mix, mapping with October. The third part can be skipped directly to with a button labeled “final stage”. "Future iterations of Outbreak will see the player stopping contemporary epidemics with modern tools. Epidemiologists, emergency planners, doctors and nurses will provide advice in the same way as the Advisors in the present simulation. Web site additions such as a forum will enable players to discuss issues raised by the documentary and the book, and share strategies to succeed at the game. A final iteration will enable players to adjust the mechanics of the game, such as the type of disease, rate of infection, or tools available to combat it, so that Outbreak functions more like an agent-based simulation. In this way, we will continue to develop a simulation that underscores the challenges of containing epidemics, all the while learning more about how games and simulations can best support engagement with important issues past and present." This page was last modified on 25 November 2010, at 09:00.